Reindeer poop bubble gum, how fun is this. Candy coated pieces of fruit flavored bubble gum. These are a great candy to fill your Christmas stockings with. 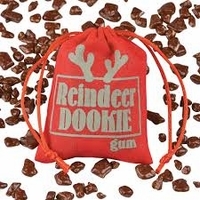 Whether naughty or nice reindeer poop will be sure to bring some giggles Christmas morning. Just like Santa's coal bubble gum you get a red canvas sack filled with little brown nuggets of reindeer dookie. Each sack of reindeer poop is 2 oz.